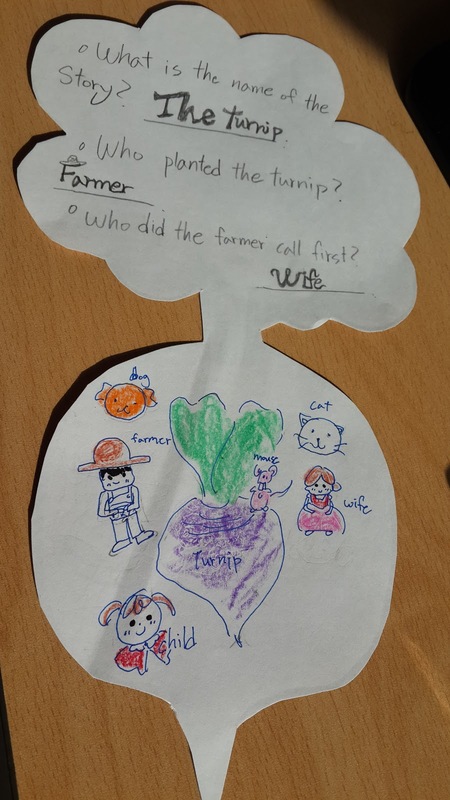 Hello all, as promised here is day 2 of my camp and it's all about the Starfall story online called 'The Turnip'. Yes, it's based on that old (Russian?) 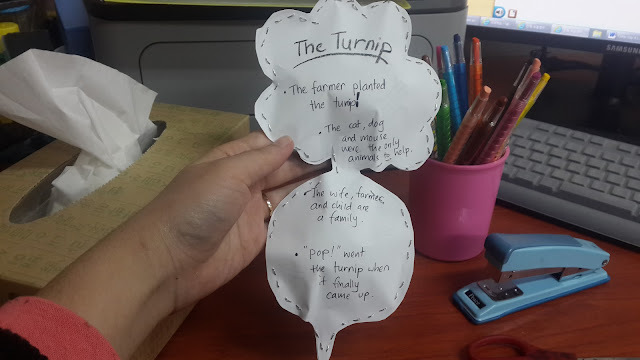 folk tale 'the gigantic/huge turnip' but Starfall simplifies it for ESL level. Love this site! Download the complete bundle of lesson resources and PPT here. So below are the activities and lesson ideas I'll do to teach the story during winter camp. An oldie but goodie, play musical chairs as you normally would but instead of just walking around or dancing around the chairs in the middle while music plays - get them moving in actions, specifically verbs you'd like to teach. 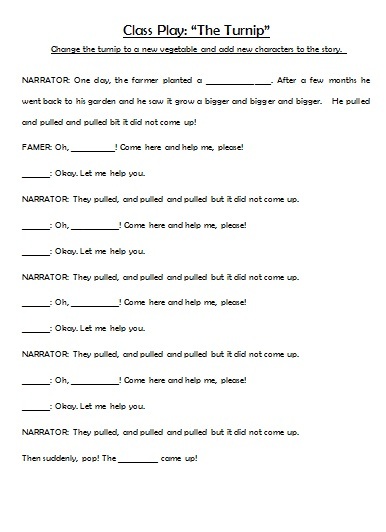 Plant, cry, pull, call, come, hold are the main verbs in the book. So act them out and teach them to students before the game. Use simple gestures. For 'call' you can mime out a telephone call or call out with hands by your mouth, for 'hold' you can hold your body or you can get them to hold their classmate's hands, etc. And 'plant' you will need to mime out actually planting a seed,etc. Have your co-teacher help when possible, or if without a co and you are with low level students, have a white board and marker ready to draw and write out words. Next, play musical chairs but while music is playing, you call out verbs and they have to circle the chairs as well as act them out. Good way to review verbs and listen. Have class in two teams or more. Move desks to make space in the class to run from one side to the other. Teams should be in single file lines on one side of the class. The first runner, runs to other side of class where a box of verb flashcards are sitting. 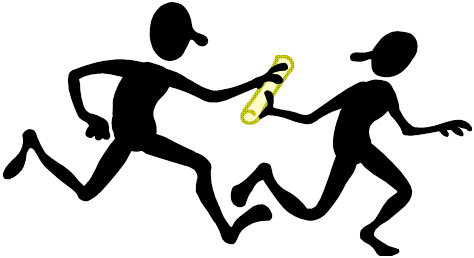 The runner should take out the card, read the verb and pantomime it to his team. When the team can correctly guess and call out the verb, then the runner can run back, tag the next in line member and the relay repeats. You can play until all the flashcards are finished, the first team to finish, wins. Teachers should be listening intently and monitoring the speaking and guessing throughout. EDIT : the word Pulled is absent from the word search! Sorry! 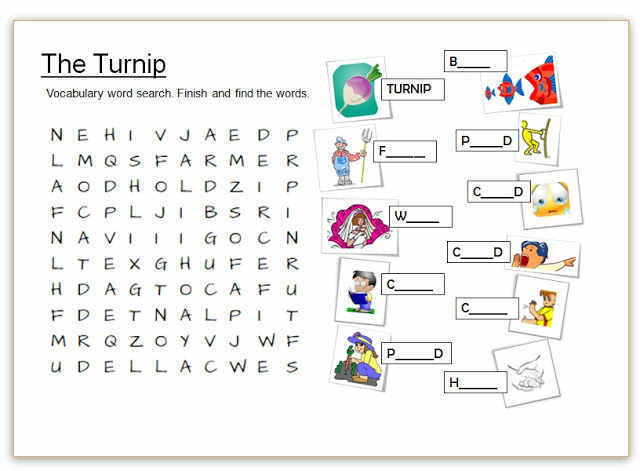 Go through the new vocabulary with pictures and also give students the word search worksheet I made to match the story. The word search should be filled in as we go along. 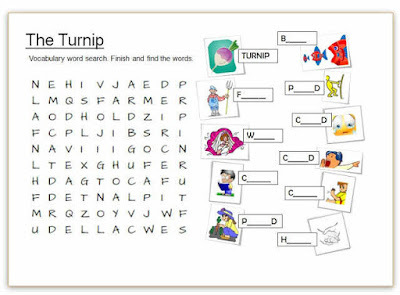 You can reward the student who is able to finish the word search first, if it works out well. You should practice spelling also. Link is included in the PPT also. Read to them once or let the computer, and then re-read as a class. Ask students if they would like to read certain pages or paragraphs also. While reading, ask discussion questions and comprehension check questions especially focusing on vocabulary. 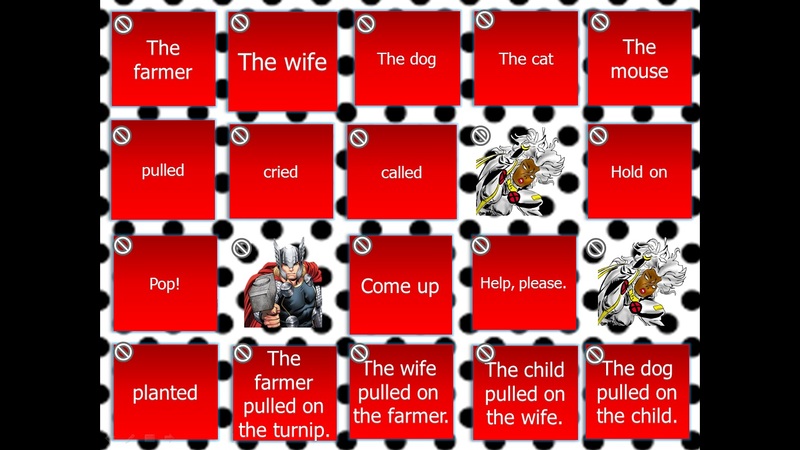 You can easily test their reading memory with the memory challenge slides. This is a silly video I found on Youtube to get them having fun when thinking about this odd vegetable. This is my sneaky way of doing a book review as well as something more crafty. I also highly recommend if you have the budget for string, you can get them to glue on string for the arms and legs of the turnip. This is a worksheet/crafty-ish idea for limited budget/time teachers. 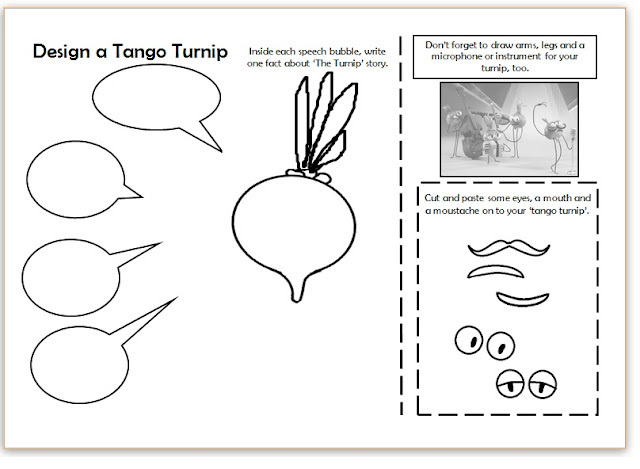 Students are able to draw and decorate their musical turnip and in the speech bubbles can write a fact about the book. 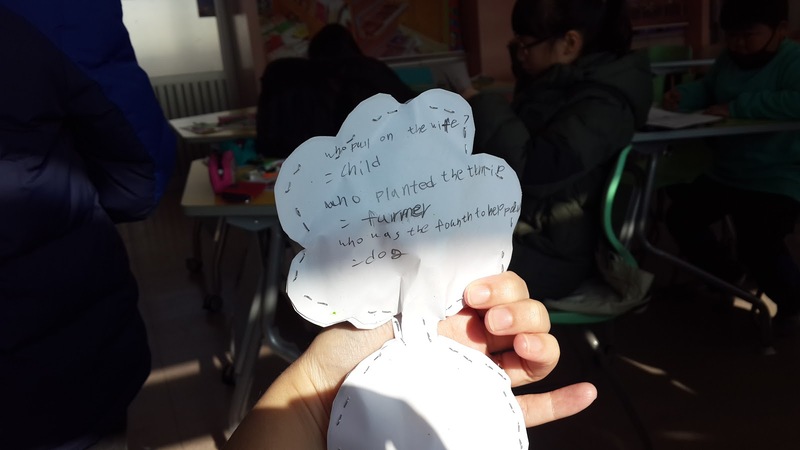 Who is in the story? What is the vegetable in the story? What animals are in the story? Who is the last one to help pull the turnip? Etc. 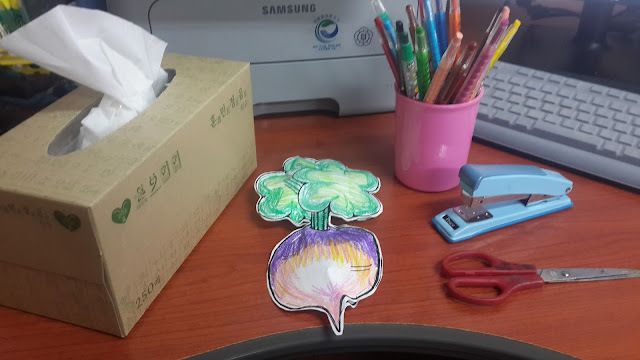 In this picture , I made the craft by printing out the turnip template (included in download bundle) and printed it twice. Cut it, coloured it and on the back wrote some facts about the story. Then I stapled half of it, stuffed it with tissue paper, stapled more, stuffed more and viola! 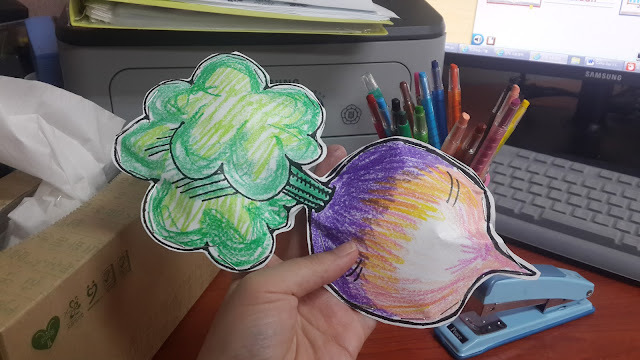 Done, a puffy colored, book report Turnip! You'd need cotton wool/tissue and turnip shapes, printed out and cut out by students, and a stapler with plenty of staples, paint and or sign pens/coloring pencils. Next, have the students cut out their 2 turnip cut outs, next staple only half around the shapes together, forming a kind of turnip shaped pocket. Stuff this with cotton wool or whatever alternative and then staple it up so it's all locked inside. 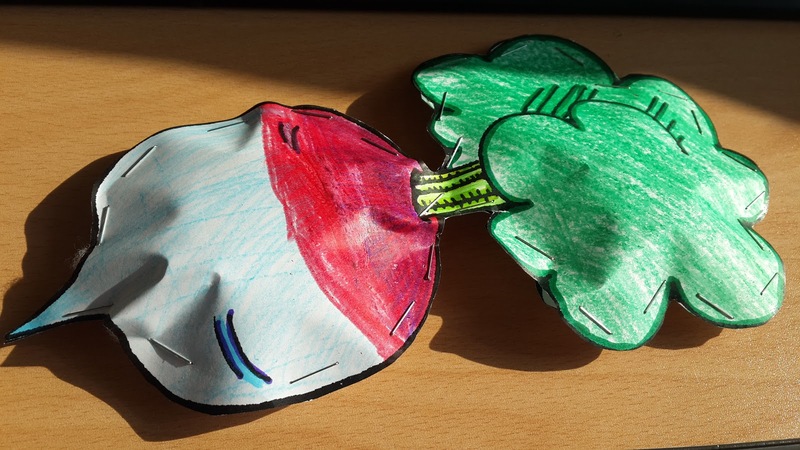 Viola, you have a puffy paper turnip. 9. Watch the Barney and Friends version of the Turnip story on YouTube. Like my Mr.Bunny Fill in the Blanks Script, this is very much the same idea. 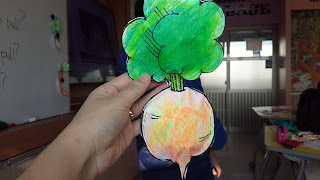 The students can write in a new root vegetable that's grown so big and got stuck. And you can also add new characters. After filling in the scripts, act and perform. 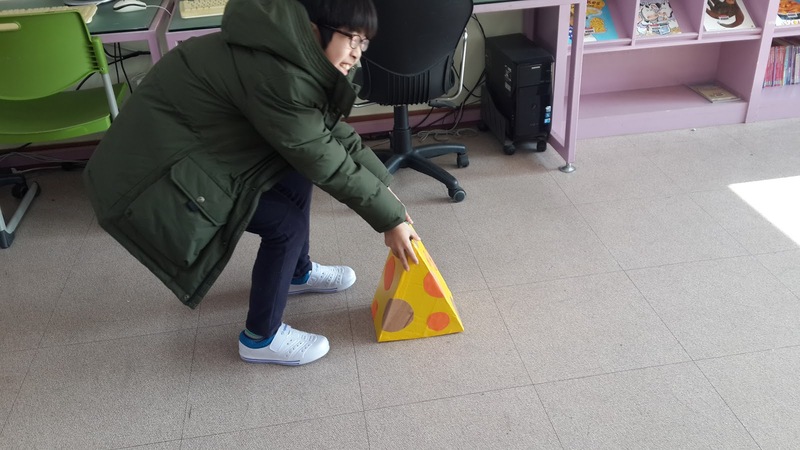 You could also just do it as a class. 11. If you have time, I made a Superhero Match-Up game with The Turnip Theme. I may or may not add a bomb game for each of these days, when I have time, or just simply repeat one of the warm ups to review and wrap up. Happy Teaching! And Happy Camping!